Stigmina needle cast is a fungal disease of spruce trees caused by the pathogen Stigmina lautii. Stigmina needle cast is often mistaken for Rhizosphaera needle cast. Microscopic observation is required to distinguish both diseases from each other. 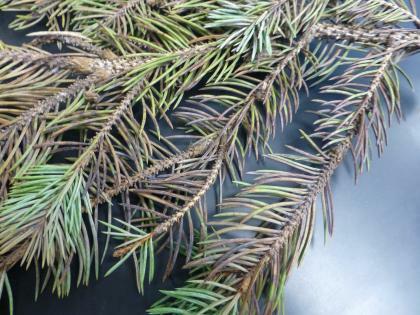 Norway, black, blue, and white spruce are hosts to this pathogen. Symptoms progress over the course of 3 years, leading to needle discoloration and severe thinning of foliage on the lower two-thirds of trees. The first indications of disease appear as tiny black spots (sporodochia) on stomatal pits along with faint yellow bands around the needles. By late summer approximately one year after initial infection, entire needles or parts of infected needles appear darker and range from yellow to tan to brown or purple in coloration. White specks of wax from stomatal pits may be visible on top of the sporodochia at this stage. 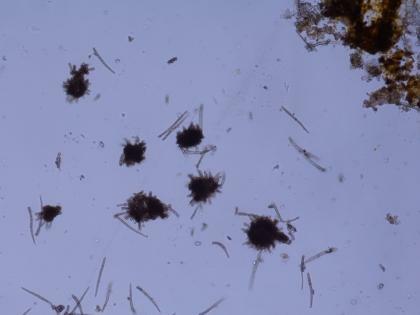 Late in the second season or at the start of the third season sporodochia produce spores, resulting in the appearance of irregular, fuzzy black lines along both sides of needles. Infected needles typically fall from trees by the end of the third summer after infection, but may also fall earlier during the second season. Young and old needles are equally susceptible, but due to tree growth patterns new needles appear green and healthy while older needles will show more advanced stages of symptoms. Early in the spring following initial infection, new spores are produced. The most abundant spread of spores and infection within the canopy occurs in the first two months after budbreak, but spore production and infection can occur as long as temperatures are above 50 °F. Immature sporodochia, which are fungal fruiting bodies, develop on needles by late spring and overwinter. In the following growing season, sporodochia produce more spores and continue the disease cycle. The Iowa State University Plant & Insect Diagnostic Clinic can help you to investigate and confirm if your plant has this disease. Please see our website for current forms, fees, and instructions on collecting and packing samples. Contact information for each states diagnostic laboratory for U.S. residents. If your sample is from outside of Iowa please do not submit it to the Plant & Insect Diagnostic Clinic without contacting us. In areas where stigmina needle cast is prevalent, the most effective management tactic is tree selection. Avoid planting susceptible spruce trees. Remove infected spruce trees means of preventing stigmina needle cast. 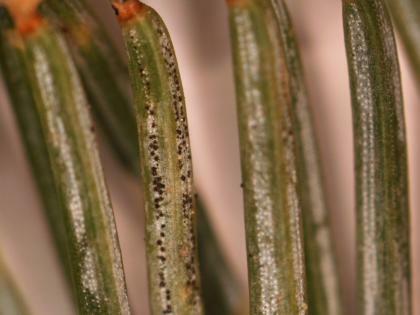 Use of fungicides is possible, but may only be sensible for larger-scale growers such as nurseries and Christmas tree farms. In this case, there are two options: (1) spray only during the first two months after bud-break to save only the youngest, most visible needles for aesthetic purposes, or (2) spray season-long to prevent infections entirely until the diseased needles fall off. In both cases, sprays must occur yearly. No fungicides are currently labeled in the United States specifically for stigmina needle cast, however, fungicides labeled for needle diseases of spruce trees may be used in the state where they are registered. Always read and follow the pesticide label according to manufacturer instructions. Labeled fungicides include products containing the active ingredients azoxystrobin, chlorothalonil, copper hydroxide, copper salts of fatty and resin acids, copper sulfate, mancozeb, mono- and di-potassium salts of phosphoric acid, pyraclostrobin, sulfur, and thiophanate-methyl.